We kept working on Pachelbel’s Canon and Meadow Minuet (with a Twinkle to close). She tried playing it without the guitar. This was unsuccessful — whenever she wasn’t sure of a note, she just randomly tried anything rather than thinking about what the note might be. I played it, pausing after each note, singing the following note with M, and asking M: Is the next note higher, lower, or the same? She was right every time, showing that she knows the tune. So I essentially modeled for her how to use that knowledge instead of guessing random notes. I had her sing it, with the sheet music, while I just played the first note of each measure, to help keep the pitches in the ballpark. This went well, except that she missed the rhythm. 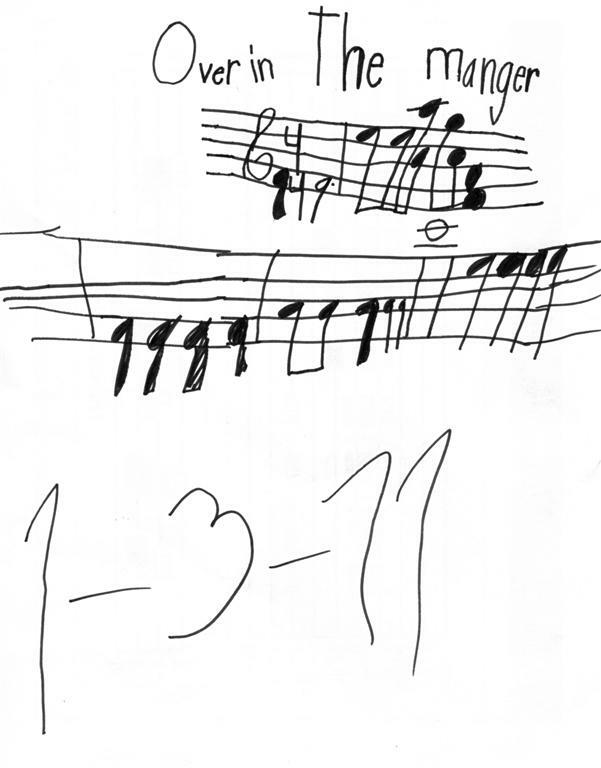 We clapped the rhythm without singing it, which helped her see that the first three measures are rhythmically identical, and the fourth measure’s rhythm differs only on the last beat. On Meadow Minuet, we worked again on the F#/B transition, specifically, on trying to hold each note for the full 3 beats rather than picking up too soon. Then M wanted to try a different section, so we worked on the first 4 bars. She has that melody down pretty well, though she made a lot of careless mistakes because of failing to attend to her hand position. Overall, a good lesson — probably about an hour long, with only minor conflict. As her activity, she put pop-bead necklaces on herself and Felicity.